Your partnership can impact lives for eternity! Imagine being greeted in heaven by hundreds—even thousands—of people who have been deeply impacted by your work! This is the motivation for many GFA World (Formerly: Gospel for Asia) volunteers as they carry out the Great Commission. What is a Team GFA volunteer? Volunteers should feel comfortable talking to people about GFA's various ministries, such as national missionary sponsorship and Bridge of Hope centres for impoverished, unreached children. Volunteers are not necessarily public speakers. In fact, most of their sharing opportunities are with small groups or in one-on-one situations. Neither do they have to travel long distances—they work with Christians in their immediate area. Simply put, GFA volunteers are servants who seek to tell others about the powerful ways that God is moving among the unreached in Asia and share opportunities to get involved. How will volunteering impact me? One of the major benefits is perhaps the greatest reward on earth: the sense of deep fulfillment that comes from following God's calling in your life. You will have opportunities to impact lives—both at home and in Asia—for eternity. You will also have the chance to partner with other volunteers in the GFA network who share your enthusiasm for reaching the lost. 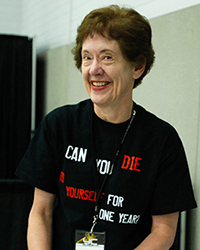 Your volunteer coordinator will provide you with free support materials and training. Volunteering is a fun, free and fulfilling way to be an effective servant of God's kingdom. Join Team GFA and become a part of life-changing ministry. You can submit your electronic application today or get details about specific volunteer positions. We look forward to partnering with you, together fulfilling God's call. 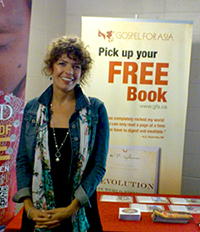 Team GFA volunteers enjoy meeting people at conferences and other events, sharing about the ministry of GFA and how they can be a part of what God is doing today in Asia! I wanted to be a missionary when I was a teen but it was discouraged because I was not robust and strong. Who would have ever thought I could reach even more people in my senior years from the comfort of my own home!!! Volunteering for GFA brings an enormous sense of fulfillment.